As a manager, it is important to stay ahead of market trends and development, as well as with the various external factors that influence a company’s success, ability to compete with others, and position in the market. Some of the most important parameters for a company to be successful are strategy, economics, management, marketing and human resource management, and this programme has a strong focus on these topics. This MBA Degree is a part-time and international programme, offered by Leeds Beckett University in co-operation with IBA International Business Academy in Kolding. Admission requirements: You must normally have successfully completed a degree in a relevant subject area at undergraduate level (bachelor or equivalent). English level must correspond to the IELTS academic score of 6.0+ or equivalent. Duration: 2-6 years part-time, 180 CATS (90 ECTS). Tuition: Price for registration is DKK 8,500. Each module costs DKK 15,000. The dissertation costs DKK 16,500. The total price is DKK 115,000. Please note: This is an online programme. With an European Executive MBA you will get the skills to be able to work with all of the important aspects of a business. You get tools as well as knowledge and methods, to use now and in your future career. Choosing the e-learning programme gives you maximum freedom and flexibility during your studies. The classes are a combination of live online seminars and teaching via our digital platform. All seminars are recorded, so you can watch them regardless of time and place. This programme is highly flexible, so you plan your own time and work schedule in close co-operation with your lecturer. You are independent of time and place. E-Learning programmes are programmes that are offered online or through distance learning, and put simply, studying by distance learning means you don't have to be based in Kolding to take one of our courses. Wherever you are, you may study with us. When you choose one of our e-learning programmes, you can study at a distance, at a time and pace that suit you. We've been running e-learning courses at the IBA since 1996 and welcome students across the world - from Denmark to Argentina and Australia to Canada. Our dedicated e-Learning team consists of specialists who make sure that our students have a great education and a great experience. our academic staff are subject experts and dedicated to delivering great courses that help our e-learning students thrive in their careers and lives. E-learning is a great way to progress further in your career - you can balance the demands of your course with your everyday commitments, allowing you to keep working while you learn. You don't have to come on to campus to attend lectures and seminars, so you won’t have to worry about relocating. Since there are no borders limiting our activities, our e-learning programmes are truly international awarding internationally recognised degrees. You'll have the option to study at home after the kids have gone to bed, in a library, in a coffee shop - or even on the bus. In fact, if you can access the internet, you can access nearly everything you need for our e-learning courses. All our e-learning courses have start dates twice a year, giving you added options. Any qualification you earn from us by e-learning is of equal value to one obtained studying on campus. As well as having access to both the IBA’s and Leeds Beckett University's libraries and electronic databases, you can use other university libraries, so you’ll have the benefit of learning resources close to where you live. All e-programmes are split up into modules giving you flexibility and enabling you to control your own learning progression. We put a lot of time and effort into ensuring you have a great experience with us. When signing up, all e-learning students are given access to online information, which specifies exactly what is expected from you - and what you can expect from us. Just because you aren't learning on campus doesn't mean you'll have to cope on your own - you'll have the support of dedicated academic staff while studying the individual modules, and our administrative personnel will be on hand to offer you advice about everything from academic issues to stress and anxiety. Our students log in to a Virtual Learning Environment (VLE) instead of attending lectures or seminars in person. The VLE gives you access to course materials such as videos, e-books and other documents. You also use it to discuss the course material with your tutors and peers and to submit your assignments and receive feedback. As well as through the VLE, you'll communicate with us through our online webinars, and emails. There is also an opportunity to attend an annual residential at Leeds Beckett University, if you like. Through LBU we are also accredited by the British QAA. Do you want to be first in line when companies need managers? By getting this education, you are able to hold a manager or mid-level manager position within an international company. You also have a good foundation for a career within consulting, marketing, finance and human resource management within the international market. The typical duration of the programme is 2 years (4 semesters). The programme comprises 6 x 12-week modules, and a dissertation. 180 CATS in total. The programme is 100% e-learning, and all classes and tests are in English. Every module finishes with a written assignment or an oral online test. Our programmes are designed with working professionals in mind and allow for flexibility within a framework. You can choose the days of the week and the times of the day you study to accommodate your other commitments, however you must meet some deadlines as advised by your lecturer. Our modules are 8-12 weeks in duration, and you are able to take breaks in between modules. Are there tuition fees on these programmes or are they free for EU citizens? Yes, there are tuition fees, and they apply to all students irrespective of nationality. Unfortunately, there are no scholarships, grants, or discounts available at the moment? Tuition fees are quoted in Danish kroner, but may be paid electronically in any recognized currency. Is an online degree as good as a campus degree? Yes, it is. There is absolutely no distinction between the quality of online and campus programmes. You can be assured that all our online degrees have the same status as those awarded to graduates who studied on-campus. Will my degree certificate state that it was an online degree, completed via distance learning? No, your degree certificate will look exactly the same as those awarded to students who studied on campus in Denmark or Leeds. There will be no reference to ‘online’ on your degree certificate. Asynchronous learning means that there are no set times for you to be online. You can log in to your classroom at times of the day and days of the week that suit you. This makes it possible for students in different time zones to participate in the asynchronous discussion threads that most lecturers run and that allow you to participate in online discussions when it suits you, and there will be webinars offered at regular intervals and video-recorded for those of you who cannot attend at specific times, or want to see them again. The e-learning concept is designed in such a way that you can always keep track of your personal learning progression. Do I need to order textbooks? For most programmes you will need to order one textbook per module. The average cost is US$120 per book. Additional e-books and texts are provided at no extra costs. No, none of our online programmes require you to travel. All teaching is done online. Even exams are online. What kind of students will I meet on my course? You’ll meet all sorts of interesting, motivated people from all over the world. But generally speaking, you’ll find that most of our online students are ambitious 31-45-year-old professionals who fit their studies around their work and other commitments. Around 85% of them will typically be in full-time employment, and have extensive work experience. Will my degree be recognized by potential employers and other universities? Many employers not only recognize IBA’s and Leeds Beckett University's online qualifications, they sponsor their employees to study with us, too. They know that our online degrees have the same status and high standards as our on-campus degrees. As UK university degrees, our online qualifications are widely recognized internationally. On average, students spend around 5-10 hours per week on their studies on the E-BA and Double Degree programmes and 10-15 hours per week on the E-MSc and E-MBA programmes. You may need more time, especially for your first module as you adjust to the learning platform, and you may need less for some modules. The time you need to spend studying will depend on many variables including your previous academic experience, your confidence with technology, and your English-language skills. You must normally have successfully completed a degree in a relevant subject area at undergraduate level (bachelor or equivalent), and your English level must correspond to the IELTS academic score of 6.0+ or equivalent. You can apply to this programme for autumn and spring intake. When applying, you need to fill out the formula bellow and attach the application form (Word) and necessary documentation (CV, exam certificates and photo ID). The application deadline for autumn intake is August 25, 2018. The application deadline for spring intake is February 1, 2018. If you have any questions regarding admission and your application, please contact Keld Hvam at +45 25 28 46 00 or khv@iba.dk. Fill out the formula and attach relevant documentation. 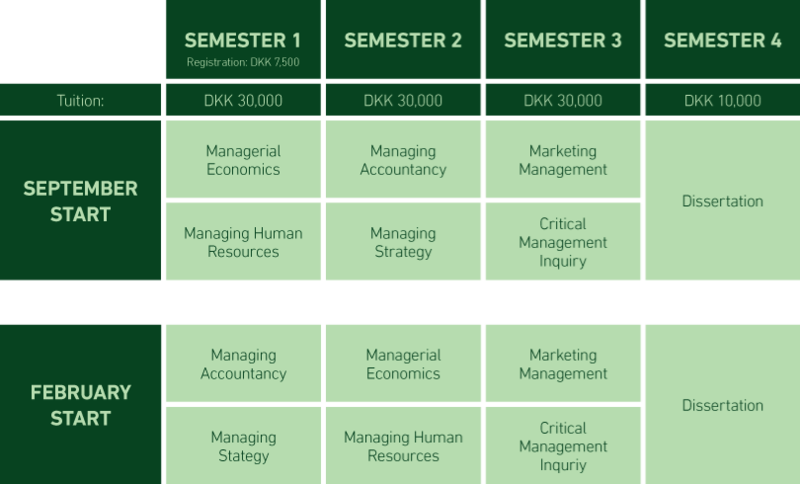 Tuition fees amount to a total of DKK 115,000, and instalments are paid no later than 2 weeks before start of the module(s) in question. You only pay for the modules that you start, and when you start them. The fees include all teaching and exams, learning support and administrative costs. Books are not included.